Events are the lifeblood of mobile gacha games, since they provide a steady stream of opportunities for players to keep engaged with the game, increasing the chances they may opt to spend some money at some point. That said, for newbies, and folks committed to playing gratis, they're also a good opportunity to gather up useful freebies. That's especially the case for Fate/Grand Order, which is notoriously stingy outside its event cycle. That said, their newest run at the pinata might be a touch tough for the uncommitted. Titled "The Demonic Capital: Rashomon", the two-week "challenge event" starts tomorrow, and will be arguably the most difficult content yet added to the English version of Fate/Grand Order. It's the first "raid" style play type to be added to the game, and will harness the power of the playerbase to chip away at a boss encounter's total HP, which runs into the trillions. The boss is the ogre demon Ibaraki-Douji (nicknamed the "Bananazerker" due to her class and yellow color scheme), who terrorized old Kyoto's Rashomon district (named for the gate that stood at the city's south portal) until her arm was cut off by the samurai Watanabe no Tsuna. Of course, it wouldn't be a gacha game event if it was all freebies, so the game's premium summoning roster is getting a new addition: Ibaraki-Douji's boss, the 5-Star Assassin Shuten-Douji. As ogre lord of Oe mountain, Shuten is actually the more famous of the two, and was killed by the hero Minamoto no Raikou after drinking poisoned sake. 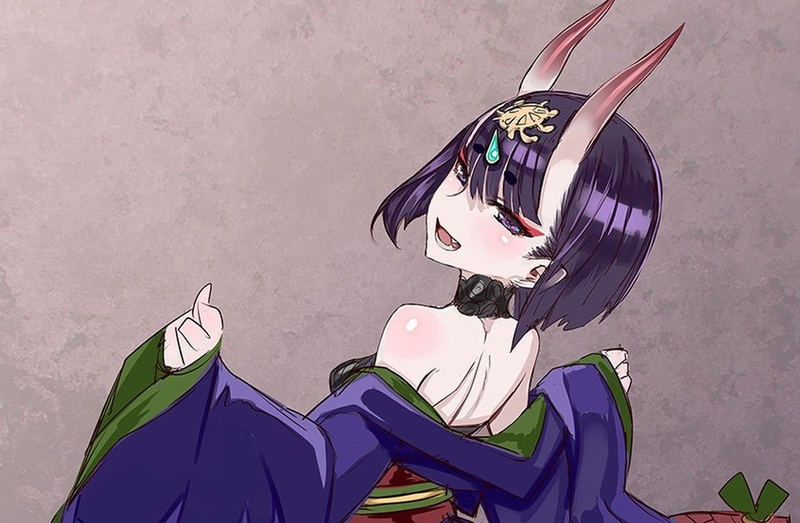 Fun fact: Shuten-Douji's name translates roughly to "Small Drunkard", and has been redesigned by Valkyria Chronicles character designer Raita Honjou to keep with the theme. She appears in-game as a tiny girl with horns that loves to get plastered.